Jordan Ingram interviewed Oregon Football offensive lineman Tyler Johnstone yesterday for FishDuck.com at the University of Oregon Hatfield-Dowlin Complex. Last season had its ups and downs for the offensive line. First, there were the injuries: Former Freshman all-American tackle Tyler Johnstone re-tore his ACL in August, then Andre Yruretagoyena and Jake Fisher went down in back-to-back weeks against Michigan State and Wyoming. The offensive Line struggled to rebound until Fisher returned to action for the game at UCLA, which allowed the offense to operate efficiently improvements every week. But that was then; it’s now a new year with a new team. 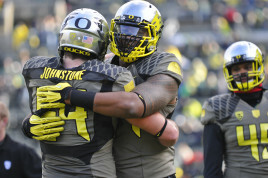 Johnstone (offense) and Buckner (defense) will be the leaders of the Oregon lines in 2015. Three starters from last year are gone, and that means it’s time for newcomers to step-up. The offensive line will be a young but experienced group in 2015, undoubtedly led by the redshirt senior Johnstone. Even though spring practices just began, the new guys on the offensive line seem to be more comfortable with the playbook, according to Johnstone, which is something the Ducks’ O-line struggled with early last season when true freshman, Tyrell Crosby, and walk-on junior, Matt Peirson, were forced into duty. Over recent years, a strong point for the offensive line has been having guys who can rotate and play multiple positions. When players prove their versatility, it adds depth to the team, which usually means they’ll get more game time. Players get banged up and might miss a game here and there — this is football we are talking about — so it’s paramount to have reserves who can fill-in and make an impact for more than one position. If Johnstone’s comments are any indication, the offensive line seems to be moving in the right direction as next season approaches. 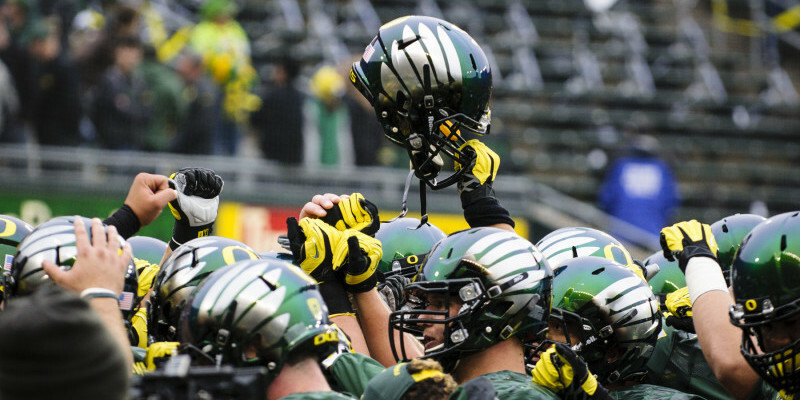 The Ducks have their leader in the trenches, are getting more comfortable with the playbook, and have the depth and versatility needed to chase another Pac-12 title — and hopefully more — in 2015. Stay tuned to FishDuck.com for more spring football coverage.